RICHMOND, VA—For GPM Investments, LLC, the aftermath of Hurricane Florence greatly affected many of its stores, employees, and store communities. GPM wanted to make an impact and ensure those struggling to rebuild were given assistance and funding. In order to help during this difficult time, GPM partnered with Samaritan’s Purse to give back and support those in need. More than 1,200 convenience store locations, including 1-Stop, Admiral, Apple Market, BreadBox, Crenco, E-Z Mart®, fas mart®, Jiffi Stop®, Jiffy Stop, Li’l Cricket, Next Door Store, Roadrunner Markets, Scotchman®, shore stop®, Village Pantry® and Young’s branded convenience stores, along with their customers, worked together to raise $65,729 to aid in Hurricane Florence disaster relief. “We sincerely thank everyone for this outpouring of support to help the victims of the hurricane. It is truly inspiring. GPM’s leaders opened the way for the love of many hearts to tangibly serve thousands of hurting neighbors through Samaritan’s Purse staff and volunteers. Everyone who helps a person in need truly is like the Good Samaritan!” said Steve Nickel, VP of Donor Ministries at Samaritan’s Purse. 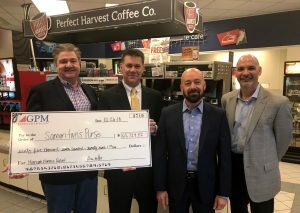 GPM executives Chris Giacobone, Chief Operating Officer, Don Muscatell Senior VP of Operations, Bill Reilly Senior VP of Marketing, and Mike Welsh Division VP of Northeast Operations, presented the generous check of $65,729 together at fas mart® store #1 in Richmond, Virginia to Steve Tomlin, Mid-Atlantic Regional Director of Donor Ministries with Samaritan’s Purse.